During my recent visit to Denmark, I had the chance to visit the Royal Danish Air Force fighter base at Skrydstrup. Squadron 727 and Squadron 730 are both located there and are currently flying F-16s but getting ready for a transition to the F-35. According to the Danish Defense website which describes Fighter Wing Skrydstrup, the Fighter Wing is located in southern Jutland and became Fighter Wing Skrydstrup in 2006. At that time, the Danish Defense Agreement set the conditions for all fighter aircraft to operate from that air base. The base comprises 856 hectares and has two runways both 3.5 km long. On the widest track two aircraft can operate at the same time. The 2010-2013 Defense Agreement set the Fighter Wing at 30 operational F-16s. A few T-17 Saab Supporter which are used for training and transport tasks as well as a Search and Rescue helicopter from Helicopter Wing Karup which operates for emergency needs operate their as well. The Danish Air Force is undergoing a double transition. The first is the broader challenge of transitioning from expeditionary operations associated with the land wars in the Middle East to a return to direct defense. The second is with the F-16 which evolved to play a key role in expeditionary operations to an F-35 which is expected to play a key role in extended direct defense of Denmark. During my visit I had a chance to talk with Col. Uffe “GUS” Holstener-Jørgensen, the Wing Commander, about his experience with the F-16 and the F-35 transition being worked by the Air Force. The Wing Commander has been flying the F-16 since 1992 and was an exchange pilot with the USAF, flew in various expeditionary operations, including in Afghanistan. With the end of the Cold War, the Danish Air Force shifted from what they referred to as a garrison defense role to an expeditionary one. This was a work in progress after the Cold War, which required changes in how the Air Force operated as well as in the evolution of the F-16 itself. The operational side meant that the Danish Air Force had to learn how to operate far from home, a task which required changes not only in the Air Force but in how the Air Force was linked to the broader Danish defense force and NATO, a subject which I discussed the day before with a senior Danish officer at Karup Airbase further north in Jutland. Shaping an expeditionary mindset and capability required changes as well in the F-16 itself as new capabilities and weapons were added to the aircraft, notably new ground attack capabilities, self-defense capabilities and electronic warfare capabilities. That evolution of the aircraft has occurred in a way, which the Danes certainly hope to see, replicated with regard to the evolution of the F-35, namely, joint and regional investments in the evolution of the combat aircraft. This has several components from the standpoint of operating the F-16. The first has been simply being able to train and operate with other coalition F-16 partners, notably within the EPAF or the European Participating Air Forces. “All the F-16 users in Europe have our own meeting forum where we talk about the development of the F-16s together with the Americans. Because Denmark is a small country, we don’t have the capacity to think what it is we need and then develop it. We need a big brother like the United States Air Force to actually develop the aircraft in consultation with us and to leverage their engineering capability to develop new capabilities. Colonel Holstener-Jørgensen emphasized that a major advantage the F-16 program has is the significant number of users, which means that there are significant numbers of airframes in operation, which facilitate investments in modernization of the aircraft. The cooperation with the other European F-16 partners extended to operations in Afghanistan where the European Expeditionary Air Wing operated together where Denmark worked with Norway and the Netherlands in Afghan operations. Although the cooperation in operations did not extend to joint maintenance, but at the training level there has been a very flexible approach to working together. This coalition integrated approach which has shaped the F-16 is clearly something which the Danes are committed to supporting and benefiting from going forward, and in this round, the British are flying the same aircraft as the Northern Europeans and the Dutch so there are expanded collaborative opportunities. And put in blunt terms, the Danes are among the most significant innovators in working coalition ops and perspectives. Given their size they need to be but clearly they are cutting edge with regard to working the coalition perspective. Their knowledge of how to evolve the F-16 over the past twenty years as they evolved their expeditionary experience is a sunk cost of capital investment, which they carry forward into the F-35 global enterprise as well. Being a good coalition partner takes practice. We have a core group in the Danish Air Force, which has done several coalition operations, and when we are not doing that we participate in multinational exercises. This is a core competence that the Danish Air Force has developed, and as we do so we work to find the gold in each coalition operation. But the transition is challenging but will benefit from the standup of the global enterprise, which for F-35A users starts at Luke AFB where the coalition partners and the USAF train their pilots and maintainers. “We will get our first F-35s at Luke within the next three years, and we develop our basic flight capabilities there and transition then to Denmark in 2023 and will end F-16 operations probably by the end of 2024. “During that two year transition, we will have dual operations. We have limited staff in terms of pilots and maintainers and that will pose a challenge in managing the transition for sure. “We can leverage the transition to work 4th-5thgeneration integration on the fly so to speak and we can also use our F-16s perhaps to red team our F-35 training in Denmark as well. 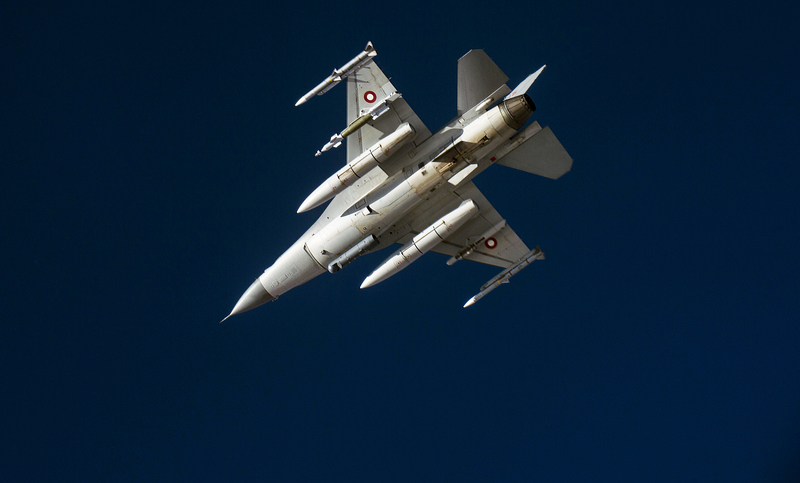 Featured photo: A Royal Danish Air Force F-16 Fighting Falcon breaks away after being refueled by a U.S. Air Force KC-135 Stratotanker assigned to the 340th Expeditionary Air Refueling Squadron, during combat operations in support of Operation Inherent Resolve, over Iraq, April 20, 2015. Coalition partners conducted the operation as part of a broader strategy to degrade and defeat the Da’esh.